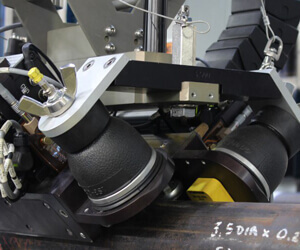 The temate® BW-LT(ERW) is an automated system for inspection of longitudinal welds in ERW tubes. The couplant-free EMAT technique permits inspection immediately after welding and reliable detection of all API defects and poor ID scarfing. Carbon Steel Tube and Castings (all API carbon steel grades). Diameter: 60.33mm (2.375”) to 406mm (16”). Consult with Innerspec for other diameters. Thicknesses Range: 5mm (0.188”) to 16mm (0.623”). Consult with Innerspec for other diameters. Provides inspection of ID, OD and mid-weld. For inspection, the pipe should be secured by pinch rollers separated by ~2m (7’) and be relatively straight and level. ½” / 1” (12.7 mm/25.4 mm) N10 and N5, ID and OD longitudinal notches. 1/16” (1.6 mm) through drilled hole(TDH). Hook cracks, pinholes, mismatch, skelp burrs, poor scarfing (OD & ID) and point defects such as inclusions and penetrators not easily detected with conventional systems. Meets all API Standards and the most stringent oil company requirements. Multi-mode shear wave technique in pulse-echo and pitch-catch configuration with sensors on both sides of the weld. Sensors located offset from the weld seam avoiding direct heat from the weld. Permits up to 6mm (0.25”) of weld wander without reducing sensitivity. Maximum sample rate of 2000 pulses per second for inspection speed of 1m/s. Two sensor assemblies (one on each side of the weld) with independent air cooling. Each sensor assembly includes an electromagnet and two EMAT RF Coil circuits. Data Acquisition Cabinet: Enclosure is 24” (610mm) W x 32.3” (820 MM) L x 69” (1750 mm) H, weighing 500 lbs (225 Kgs).